Making hailed corn into corn silage can be a good option. Photo credit Troy Walz. HIGH MOISTURE FEED OPTIONS TO GET IT OUT OF THE FIELD EARLIER. Making hailed corn into corn silage can be a good option for those with cattle or that have neighbors with cattle. For those with feedlot cattle or that can sell to neighbors with feedlot cattle, then high-moisture corn or earlage are options. 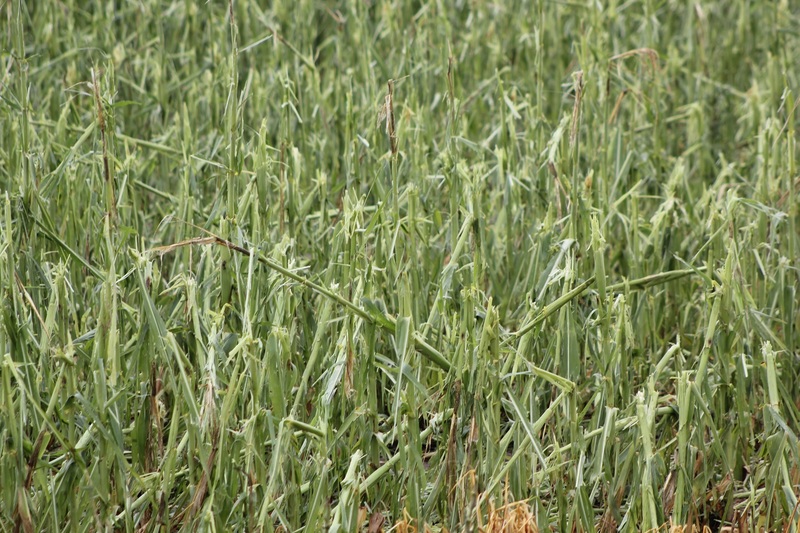 Due to the dilution effect of the plant material, silage is likely a better option for harvest of mold containing ears than high moisture corn or earlage. IS THERE VISIBLE MOLD GROWTH? The good news is that the most common fungi observed has been Diplodia ear rot which does not have a mycotoxin associated with it. However, Fusarium ear rot has also been observed and fusarium species can produce mycotoxins, including fumonisin, vomitoxin (DON), and/or zearalenone. When properly done the ensiling process will halt the growth of mold. However, the mycotoxins that were already produced are not destroyed during the ensiling process. Thus, mycotoxin testing is suggested. If needed, blending non-contaminated feeds into the diet can be used to reduce potential negative effects. For more information see G1514 Use of Feed Contaminated with Fungal (Mold) Toxins (Mycotoxins). NUTRIENT CONTENT OF LATE SEASON HAIL DAMAGED CORN SILAGE. Late in the season most of the grain production has occurred. Thus, if only leaf and upper stem has been lost the grain content of the silage may actually be greater than under normal harvest conditions. Grain content relative to forage can be estimated after putting up the silage by getting a starch analysis and dividing % starch by 0.7. For instance, if the analysis showed that the silage was 35% starch the percent, grain would be estimated at 50% grain (0.35/0.7). While the grain content may be increased, the digestibility of the plant material (fiber) may be decreased as stalk may make up a greater proportion than normal. Thus, a nutrient analysis of the silage will be important for effective use in rations. THE POTENTIAL YIELD IS IMPORTANT IN DETERMINING COST EFFECTIVENESS OF CORN SILAGE. In corn that is between ¾ milk line and blacklayer, the leaf makes up about 15-20%, the stalk 20% and the ear 55-60% of the dry matter (DM) yield. The top 1/3 of the stalk constitutes only 2% of the total DM yield. Thus, with complete leaf and the upper part of the stalk loss due to hail, corn that would have yielded 10 tons of DM/ac would yield around 8 ton/ac. Under this scenario silage production would likely be a cost effective option. If some ear loss occurred or if a proportion of the plants are broken, such that they would not be harvested, the lower yield potential will increase the harvesting cost. If cost of silage harvest is $75-100/ac (as an example) and yield is 10 ton/ac, then the harvest cost will be $7.5-10 per ton. With loss of just leaf and upper stem the cost per ton increases to around $9-12.5 per ton. However, if 25% of the ears were also lost in addition to the leaf and upper stem, then the silage may only yield 6.5 tons DM/ac and harvest cost will be 50% more than typical at $11.5-15 per ton. MOISTURE OF THE HARVESTED MATERIAL VERY IMPORTANT. For corn silage, the target for the material to be ensiled should be 60 to 65% moisture (plant included). Looks can be deceiving since the ear and bottom portion of the stalk make up the majority of the material. The brown leaves (that were damaged by hail) can give the appearance that the plant is drier than it actually is. Harvesting the whole plant, chopping it up, and drying it down is the only way to get a good estimate of moisture content. For more tips on making good silage see the Beefwatch article Silage Considerations. PRICING OF SILAGE WHEN SELLING TO NEIGHBORS WITH CATTLE CAN BE DIFFICULT. First, all the feeding risks associated with the mycotoxins are on the cattle producer. Second, not knowing yield, and thus harvest cost per ton makes pricing challenging. For standing crop and normal silage, the price for silage in $/ton (as-is) is approximately 7.65 times corn price. This assumes normal yield and would need to be decreased if harvest cost per ton is dramatically greater.